The study of the mechanical processes that occur within the aorta—both healthy and diseased—from an engineering perspective is rapidly progressing. Understanding the exact biomechanical processes that underlie aortic disease, such as aortic aneurysm, dissection, and rupture, is a critical supplement to clinical studies of the natural history of these diseases. Engineering analysis promises to enhance management and timing of surgical intervention. 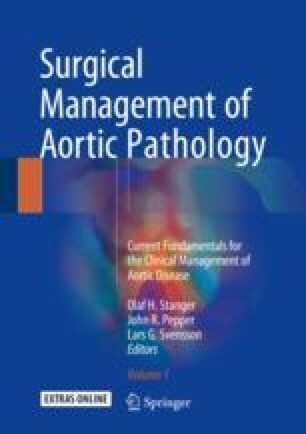 In this chapter we discuss the current understanding of the mechanics of the thoracic aorta and thoracic aortic aneurysm based on in vivo and ex vivo studies. We address also the clinical application of engineering insights and their significance for surgical decision-making. The online version of this chapter (doi: 10.1007/978-3-7091-4874-7_10) contains supplementary material, which is available to authorized users. WISQARS leading causes of death reports, 1999–2007. 2014. http://webappa.cdc.gov/sasweb/ncipc/leadcaus10.html. Accessed 25 Oct 2014.